Imagine you are a delivery driver asked to ship a parcel from New York to Africa. You own a time-travel machine which can transport you millions of years in the past. If you could time travel to the past, how many years in the past would get you the closest distance from New York to Africa? Because, if you’re going to deliver a parcel with a time travel machine, you want the year when these two continents were closest. We’ll get back to our delivery in just a second. But first, let’s talk about continental drift. 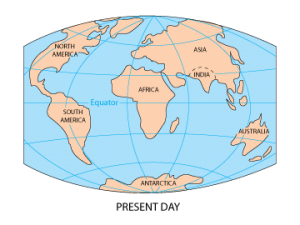 Continental drift is the idea that continents passively move due to the movement of plate tectonics. Like a conveyor belt, continents ride on a plasticky layer known as the asthenosphere. We know continents move because we use GPS sensors to track their movements. We’ve calculated that continents move about 5-10 cm per year on average. So this is about the same length your fingernails grow every year. Instead of just years, how far have continents moved over millions of years? Because when you think of Earth in a geologic time scale, continents have traveled thousands of kilometers. Because of convection in the mantle, we can accredit our constantly realigning continents. 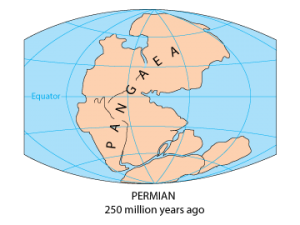 In the Permian period, there was just one continent. And one ocean. 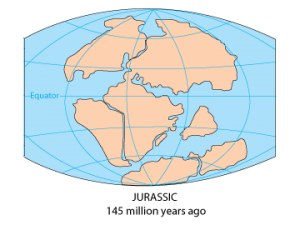 If you had a time capsule and traveled back in time 250 million years ago, you’d experience Earth as the supercontinent of Pangaea. From coast to coast, Pangaea was surrounded by the superocean Panthalassa. 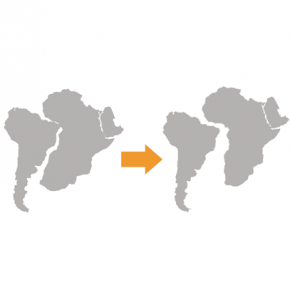 Gradually, continental drift teared the supercontinent apart into separate continents. Let’s rewind 200 million years. Humans didn’t exist. Instead, dinosaurs dominated the land. If you travelled back to the Triassic period, two enormous-sized continents were meshed together. First, Laurasia comprised of today’s North America, Europe, Greenland and Asia in the north. Second, Gondwana was pieced together with present day Africa, South America, Australia and Antarctica. And smack dab in between the two land masses was the Tethys Sea. As continents drifted away from each other, Pangaea became less recognizable after each millennium. This is because our present day map was starting to take shape due to continental drift. Over time, dinosaurs become extinct. Today, we uncover their fossils. At one time, they lived on the connected Pangaea. Now, we piece together where land was connected from the fossils we discover. In the Cretaceous period, the present day geography has become more distinguishable. All of a sudden, the world map starts to resemble something we are all familiar with. But it’s not quite there just yet. For example, we have a clear division between Europe and North America. But the Atlantic Ocean needed to expand just a little more for it to be our modern placement of continents. This is the present day Earth that we see in a world map. It has 7 continents and 5 oceans. It took a long time for continental drift to mould the planet. This is why the geological time scale of vital in importance. Today, we pick up the pieces and look at the clues of Pangaea. For example, notice the striking similarities of continental boundaries aligning in a world map. We also have strong evidence of Pangaea because we find fossils from the Pangaea Supercontinent from animals that couldn’t swim or fly. 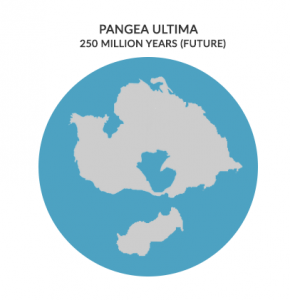 About 250 million years ago, there was just one massive chunk of land known as Pangaea. If you look at a world map, you can still piece together our continents like a giant jigsaw puzzle and recreate Pangaea. Over millions of years, plate tectonics have torn apart Pangaea creating distinct continents and oceans. Plate tectonics are always moving. But they’re deceptively slow. The land we live on never stays still. We know they passively move because GPS satellites measure their slight movements. Plate tectonics have carved out 7 distinct continents and 5 oceans where we live today. 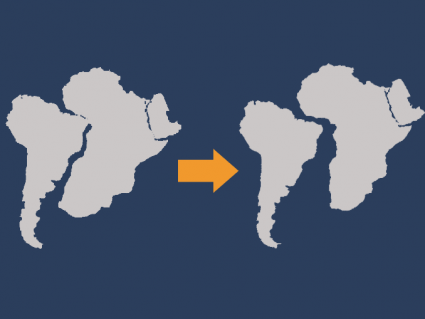 Eventually, continental drift will assemble another supercontinent called Pangea Ultima. If you were in the Permian Period, it would be a short delivery from New York to Africa. You wouldn’t even need a boat or airplane. That’s because New York and Africa were connected at this time. So what would you set your time machine to for the quickest delivery? If you set your time machine to 250 million years in the past, you’d be a stone’s throw away to deliver your parcel from New York to Africa.